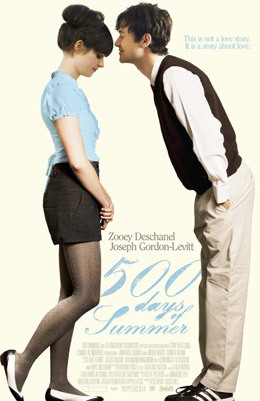 This is a movie treasure that captures the true messiness of love and dating. It is unique in telling the story from the male point of view and uses a terrific soundtrack. Netflix it now, especially if you’re heartbroken and still single. Love, almost always starts off with one person loving the other person more. For those lucky in love, the other person begins to feel that way too. More often, sometimes a year, 500 days or even a decade can go by and the person the love is aimed at likes being adored but they don’t find themselves in love with the other person. While they are ready to pass the time having fun with the other person they don’t feel the same way. They’re enjoying themselves, perhaps honest like Summer about wanting a casual relationship and also giving out endless mixed messages. There is an emotional danger in mixed messages because it’s too easy, to hang on to the messages that match your own point of view and ignore the rest. We watch Tom, drowning in expectations, shred his heart to pieces with hope while Summer clearly announces she doesn’t want a boyfriend several times. Instead of really hearing her, Tom hangs on to the fact she shares a story she never told anyone before. He’s right this is a possible clue to a future, but it is only a random bread crumb, not an entire path. He fails to make this distinction and breaks his heart. It’s very similar to Jenny Sanford believing her husband was “sweet and honest” when he refused to say he’d be faithful in his wedding vows. Denial belongs to all of us as human beings, not just alcoholics. It is Tom’s younger sister who tells him to go back and really think about all the clues he ignored that she just wasn’t into him. Even the voiceover announces, “Tom believed his expectations would align with reality.” Of course, he ends up crashing headlong into reality because his hope and expectations are taking him on another false reality journey. Love does that. We pretend things are better than they are, stay in sketchy relationships far longer than is good for us vs. risk waiting long enough for the other person to finally recognize we’re the one. 500 days is a reasonable amount of time to struggle with that dilemma, while 3 years or more is not. Being single is hard if that’s not what you want, finding the right person is even harder and both people reaching that magical place of feeling deeply about each other is even more rare. Uncertainty and ambivalence will always be part of dating. This is why it can be a mistake to make Valentine’s Day a test for a relationship that has hardly gotten started. Still, the risk of love is worth the broken heart, and you have to find your courage to keep on taking the risks. Rhoda! I love this article…i forwarded it to all my single friends. Young women are so caught up in the IDEA of a relationship and so often fall in love with that concept rather than the actual person. Such a shame because they miss out on life due to their confused focus. I have truly embraced being a single woman and I love it 🙂 Hope all is well! It was one of my favorite posts so I really appreciate you spreading the word! !